If you have inadmissibility, you may be aware of the fact that you can be denied entry to Canada. In order to overcome that inadmissibility, you must apply for a temporary resident permit before coming to Canada. However, applying for a temporary resident permit can be an overwhelming task. You, as an applicant, will need to persuade an immigration officer to believe you have a compelling reason to come to Canada, and you do not possess any threat to Canadian citizens and permanent residents. In this blog, you will learn about what the officers are looking for in a temporary resident permit application. 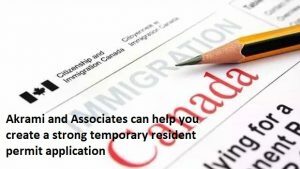 The purpose of applying for a temporary resident permit is to acknowledge your inadmissibility. That being said, you need to prove you have completed all the conditions of your sentence. Furthermore, it is highly suggested that you demonstrate you have changed your habits towards drinking since your offence, perhaps by completing an alcohol abuse treatment/counselling. These actions help convince an immigration officer that you have fully reformed, and you have no intention of repeating that mistake ever again. An immigration officer will evaluate your application based on your “need vs. risk.” This means you not only need to prove that you will not pose a threat to Canadians, but also need to provide a compelling reason for your travel to Canada. The immigration officer will examine whether your need to come to Canada outweighs the threat you pose. Immigration officers often deem reasons, such as visiting a sick relative, attending a family wedding, or attending a business trip, more compelling. Inadmissibility can result from having a past criminal conviction on your record, having a health issue that is expected to place excessive demand on the public health services Canada provides, or misrepresenting information that is directly related to decisions made under the Immigration and Refugee Protection Act (IRPA). That being said, in order to prepare for a strong case, you will need to have a thorough understanding about your specific circumstances The following scenarios will help you get an idea of what the typical examples are. If you have a health issue, you may want to provide reference letters from your doctor advocating that you are currently, and can continue to be, in a good health condition to travel to Canada. Apart from the letter from your doctor, you will also need to provide medical records from your doctors. If you have a criminal issue of any kind or are considered a threat to the security of Canadians, you will need to complete all the conditions of your sentence. You will also want to provide reference letters from employers, friends and family to show the significant change in your behavior since the incident. Proof of enrollment in any rehabilitation program centered on drugs, anger or alcohol will also help to prove you are no longer a threat. In addition to this, it is necessary for you to write a personal statement, describing how and where the incident occurred in your past. If you are financially unstable, and have not been permitted to travel to Canada in the past for this reason, you will need to provide bank statements to prove your financial situation has been improved. If you do not feel you can prove you are completely financially stable on your own, you can have your Canadian host sponsor your trip to Canada and claim responsibility for ensuring you have sufficient funds for your trip to Canada and your return trip to your home country. Finally, if you have misrepresented yourself in the past, you must prove this was a complete accident, and you did not have the intention to lie to an immigration officer. It would help to provide references to try to convince an immigration officer that you are representing yourself honestly, and have no intentions of lying. Unfortunately, it is very difficult to overcome being inadmissible due to past misrepresentation, because it is very hard to provide proof to an immigration officer that your misrepresentation was a complete accident and now you are being completely honest. This is why we invite you to consult with an immigration professional prior to submitting the application on your own. In the way, you can ensure your application is filled out completely and thoroughly. The Canadian government is very strict when it comes to assessing foreign travelers’ inadmissibility. It is essential that you have taken all of the aforementioned requirements and documentation into consideration before you attempt to apply for any of the applications to resolve your criminal inadmissibility. These applications are difficult applications to pursue on your own, and it is highly recommended that you seek out professional and experienced help prior to submitting the application. Akrami & Associates work and have experience with many different immigration issues. We have helped many of our clients that have criminal inadmissibility apply for these applications to resolve their criminal inadmissibility. Please feel free to contact Akrami & Associates at 416-477-2545 for more information, or if you would like to book a consultation with an immigration professional for more advice. With Akrami & Associates, there is always a way!